Ahhh date night, the night you have been waiting for all week long. Thank goodness it has arrived. Don’t worry we aren’t referring to a glamorous evening that quickly has you and your date running as fast as you can from robbers like Steve Carell and Tina Fey’s characters in the movie ‘Date Night,’ but more so a relaxing and memorable night away from the kids, parents and pets in a romantic mesmerizing destination known as Niagara Falls, Canada. Rekindle your romance, let the sparks fly and leave the driving to us. If planning your weekly or maybe monthly date night is a hassle, don’t let it be as Hornblower Niagara Cruises has something new and different that both of you will talk and reminisce about for years. The all new evening cruises gives visitors travelling to the ‘Honeymoon Capital’ and locals of the Niagara Region an opportunity to experience the world-wide tourism attraction past 6pm with brand new evening cruises including the ‘Falls Fireworks Cruise and the Falls illumination Cruise.’ The cruises are a fantastic way to explore the waters, experience the Falls lite with vivid colours and watch the sparks fly in the starry skies above. Our 700-passenger state-of-the-art catamarans are designed to give a spacious and one-of-a-kind view of the Niagara Gorge and the three worldwide famous Falls. If you are one of the lucky ones you resides in the Niagara Region, then be sure to experience this brand new attraction in Niagara Falls so that you too can share with your friends, family and guests travelling from out of town. 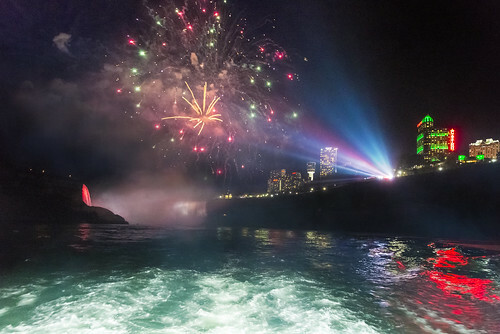 The evening cruises begin as the skies turn from a baby blue to shades or warm reds and oranges with the Sunset Cocktail Cruise beginning at dusk at 8pm followed by the night time cruises of the Falls Illumination and Falls Fireworks Cruises beginning at 9:45pm. The colouful evening experiences are a 40-minute experience on board. If you are looking to set the mood for your special someone then be sure to enjoy a glass of wine or maybe two at the onboard bar located on the lower level of the boat. Enjoy a selection of sweet and salty snacks to accompany your Niagara wine or beer also available at the bar. The evening cruises are great if you are looking to dance the night away as the music plays as the boat approaches the Falls. Visitors are encouraged to pick up a glow wand for purchase before boarding as it adds a splash of colour to your experience. If a glow wand isn’t for you, then be sure to view a selection of over 20 different retail items available for purchase at the Visitor Pavilion tent. The bonus about date night is being able to plan the perfect date in advance by purchasing your evening cruise tickets online. Be sure to print off your tickets upon arrival to avoid the lines and to keep your sweetie smiling. If you are looking to make your date night even more special with the perfect proposal then be sure to call us at 905.NIAGARA to assist in planning your magical moment with us in Niagara Falls, Canada. Your date night awaits you!